Are you interested in taking a bus to Sisters Outdoor Quilt Show? We’re looking into organizing a chartered bus. Please take a moment to fill out this form so we can gauge interest. 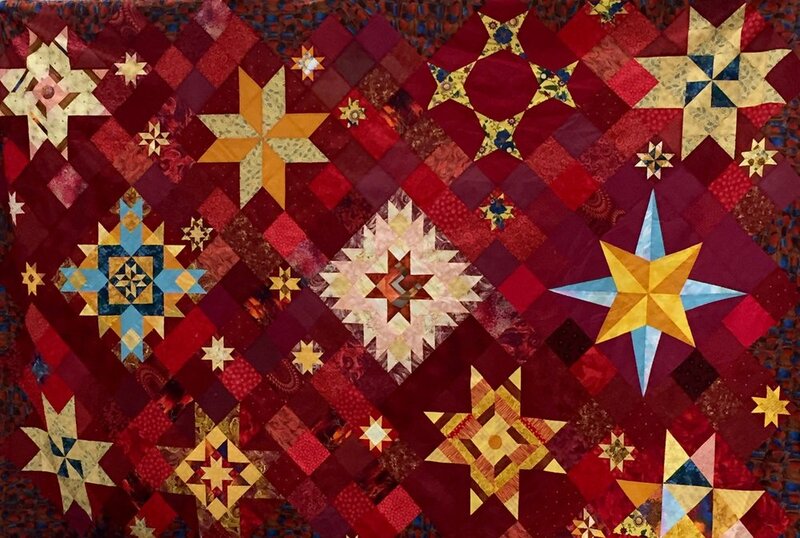 Remember: Sisters Word Quilts are due by our June 2nd Open Sew Day! Greetings Members! On May 17th, we met for our fifth guild meeting of the year. Our president, Kimberly opened the meeting by showing members a Creativebug intro video featuring PMQG member Rebecca Rinquist. Don’t forget that Creativebug has offered PMQG members one free month of membership to new email sign ups by using the code SBA. Next, Kimberly welcomed new members and our new business member Cindy Lundy from Stitchy Goodness. Then we wished all members with a birthday in May a Happy Birthday. Next, Susan went over the upcoming programs and workshops. These include Chawne Kimber on June 21, 22 and 23, Anna Maria Horner on November 15, 16 and 17, and Denyse Schmidt on December 6, 7 and 8th. All of Chawne’s workshops are currently sold out. Waitlists are available on our website. Details for Anna Maria Horner’s and Denyse Schmidt’s classes will be announced later this year as well as the date the classes will be on sale, so start saving! Next, Susan introduced out featured speaker for the May Meeting, Alison Glass. Alison is a fabric designer for Andover Fabrics, and has designed over 600 fabrics for them. Alison designs with the goal of having her fabrics flow from one collection to another. Lumen, made using paper piecing. among others. Be sure to follow Alison Glass on Instagram @alisonglass and through her website. Watch out for announcements for a sewalong this fall for Trinket! 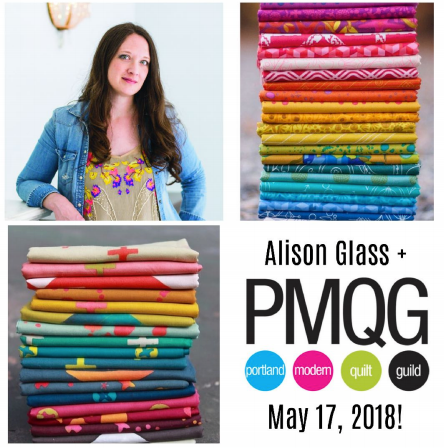 Next, we announced a special collaboration with Alison Glass, PMQG and Anover Fabrics, the Kaleidoscope Fabric Challenge! We are currently finalizing the rules for this challenge, but they will involve making a mini quilt using either a cool or warm color group of Kaleidoscope, so start thinking of your designs! Next, we spoke about our Charity programs. First are many quilts in various stages that you can help make. Take a packet to make a top, quilt a quilt, or sew some binding. Visit our Charity table to see what’s available. Also available are wonky stars blocks for sewing as well. Don’t forget about Charity Sew Day on May 24th at Modern Domestic! Next, we had our raffle. We had a total of 6 prizes to give away at this meeting! The Alison Glass Applique book donated by Lucky Spool and Michael Miller FQ Fabric Bundle donated by Michael Miller Fabrics was won by Jenny McKee. 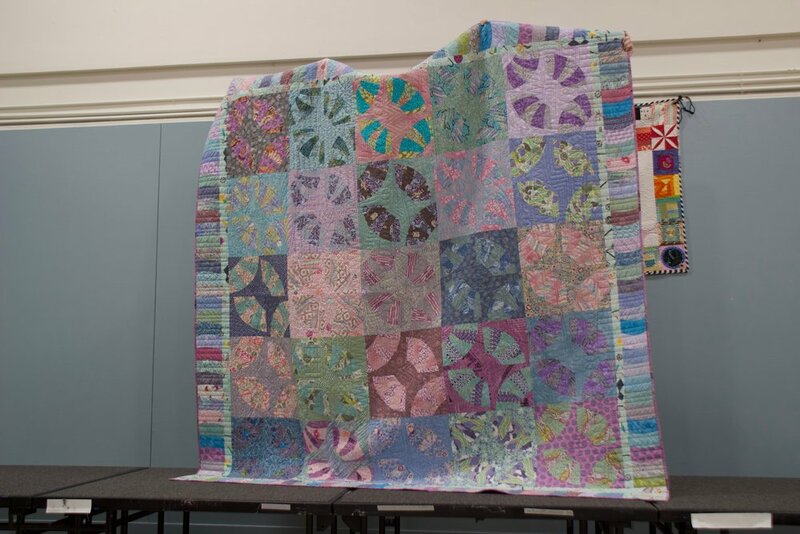 The Kaffe Fassett Passionate Patchwork book and Kaffee Fassett fabric bundle, donated by a PMQG Member was won by Jan Paxton. The Beyond Cotton book, donated by Lucky Spool and Art Gallery Fabrics FQ Bundle, donated by Art Gallery Fabrics was won by Kara Bee. Michel McDowell donated two bags of goodies filled with sewing goodies from his recent trip to Japan, and these were won by Kristen Ritz and Nancy Barnes. Finally, the Memphis Time quilt pattern and FQ Fabric bundle, both donated by Kim Kight was won by Chris Batton. 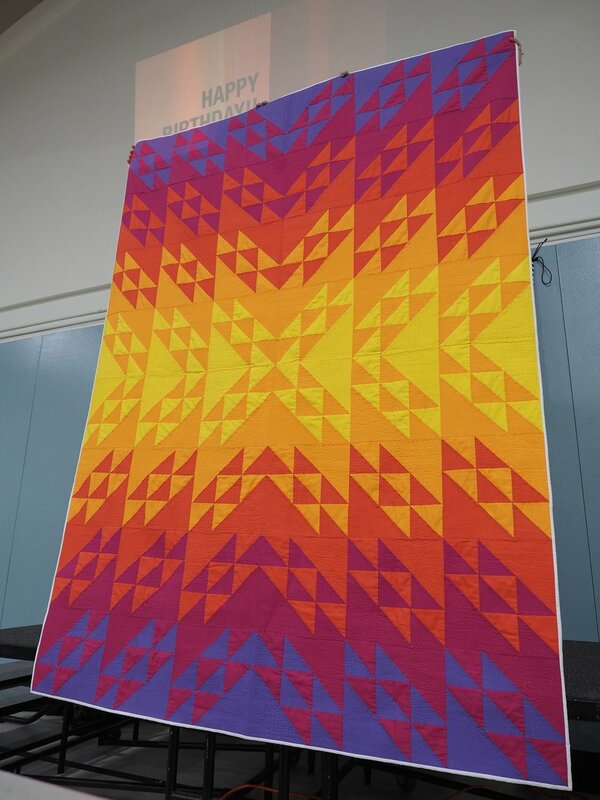 Next, Corni from the Central Oregon Modern Quilt Guild presented information for the 2018 PNW MQG Meetup. It starts Friday, August 10 and lasts until Sunday, August 12th. The meetup is going to be at Grace Baptist Church (63945 Old Bend Redmond Hwy, 9770) in Bend, OR. Housing will be on your own. Activities include a Brewery Social, Sunday Park Breakfasts, Swag Bags (only for those who sign up before June 1st!) and Door Prizes, Charity Sewing and a Shop Hop. The cost is $40 for MQG members and $60 for MQG non-members. If you have any questions, please email COMQG@hotmail.com or CorniQ@me.com. You can find the registration here. Don’t forget that Sisters Word Quilts are due by June 2nd. The PMQG Special Exhibit has always hung on buildings, which include Paulina Springs Books Co. Brad Smith, owner of Paulina Springs Books Co. is gravely ill. We request that members send messages of support to: Paulina Springs Books, PO Box 3500-407, Sisters, OR 97759, or via email to books@paulinasprings.com, subject line: For Brad. 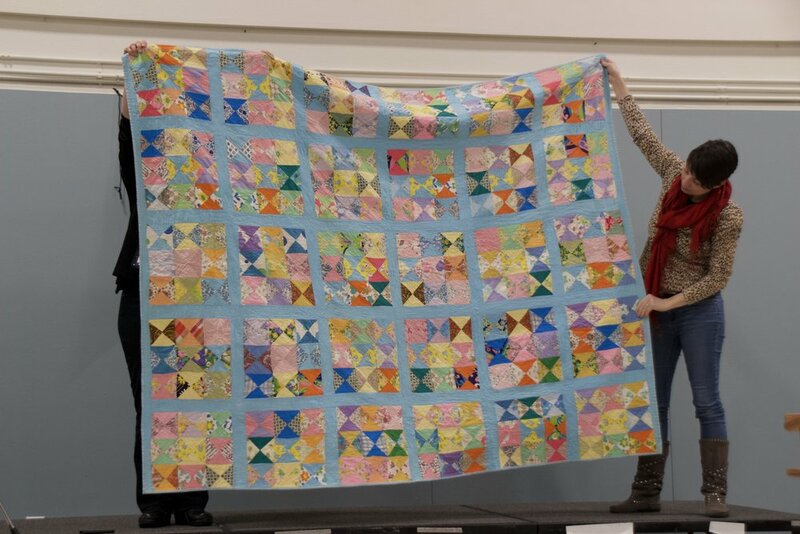 This is a sad time and it will be a huge loss to our Sisters and our Quilt Show Community. 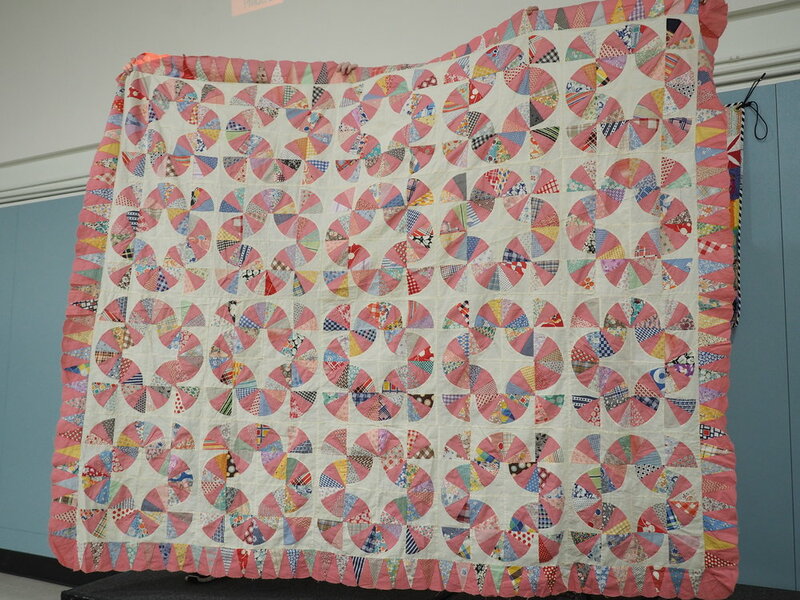 The 2019 Sisters Special Exhibit theme has been decided on, and will be Rainbow Quilts. More information to come! 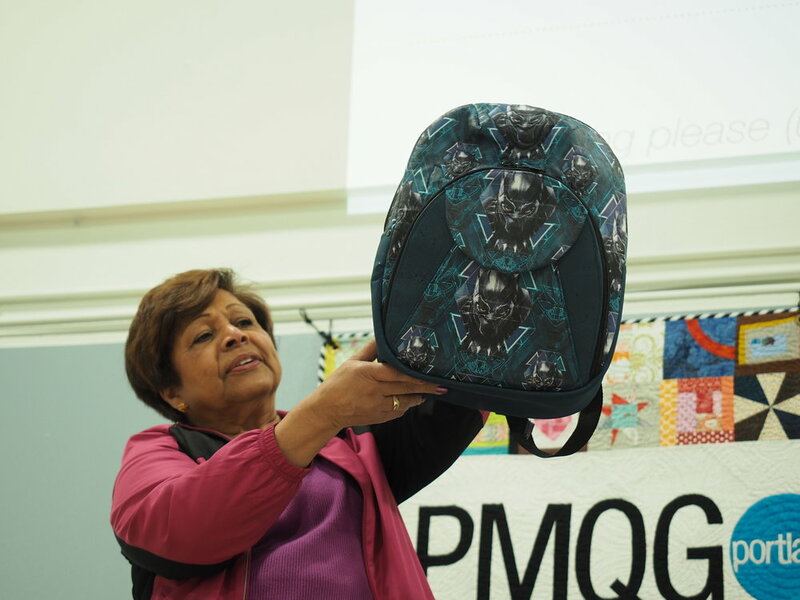 Don’t forget about our Classifieds, with all proceeds going towards the PMQG Scholarship fund. Find out more information here. A special note about our July 7th Open Sew Day - We’re going to be moved to Back Classroom and (if needed) the new small classroom near former customer service desk. ONLY FOR THIS SEW DAY. Don’t forget about the PMQG Discounts available! Quilt Canvas is offering one free month of quilt design access to new emails with the online code PMQG-4 and Fabric Depot is offering $10 off all After Party classes and events with the online code PARTYWITHUS. June 2, 2018 - Sisters Word Quilts due! On May 13th, we had our first workshop of the year with Kim Kight, entitled Memphis Time at a great workshop space in SaveStores. This was a workshop that focused on creating a watch block using straight piecing, appliqué, curved piecing, and paper piecing. Many thanks to Kim and SaveStores for the awesome workshop! Here's your opportunity to apply for scholarships for the upcoming workshops. Deadline to apply for both is April 30th. Recipients will be chosen by the Random Number Generator and will be notified on May 1st. ONLY PMQG Members are eligible for scholarships. On April 19th the guild met for our fourth meeting of the year. We began the meeting with a new initiative where we’ll show a short video at the beginning of the meeting highlighting the talent of the guild. At this meeting, we showed a short video from Creativebug featuring Susan Beal, our Programs Coordinator for Meetings. Creativebug has provided one free month of unlimited craft classes from instructors like Anna Maria Horner, Carolyn Friedlander, Heather Jones, and Denise Schmidt. That code is SBA and can only be used with a newly registered email address. 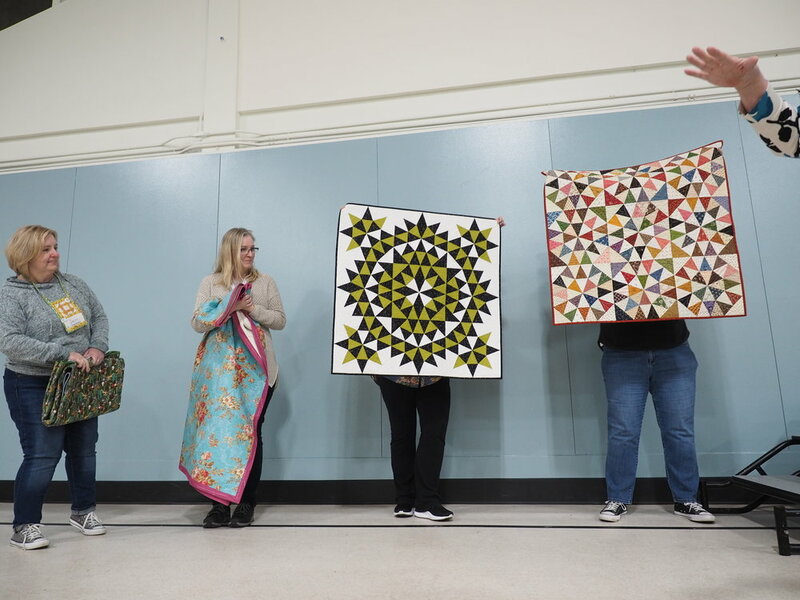 After welcoming new members and congratulating April Birthdays, Kimberly showed off snapshots of the Clark County Quilters Annual Quilt Show that happened April 5-7th. We had five members of our guild participate and they were Laura Broughanle, Kristin La Flamme, Violet Craft, Kimberly Buckley and Tam Gardner. Next, we did a short recap of our Spring Retreat. This year, we had 34 members enjoy 3 days of sewing, delicious food and outdoor activities (when the weather permitted!). We’ve rebooked Camp Tilikum for next year’s Spring Retreat on April 11-14th, 2019. Next, Susan gave details of our upcoming workshop, Memphis Time, presented by Kimberly Kight of Cotton and Steel. The workshop is on May 13th from 10:00 to 4:00 and is $75. PMQG has the privilege of being the world debut of this class. Each 17 x 90” block uses straight piecing, paper piecing, appliqué and curved piecing. At the end of the workshop, you’ll have one completed watch that can be used for a table runner or as the beginning of the full size quilt. During the workshop, students will have a chance to win a Fat Quarter stack of any of the collections Kimberly has produced with Cotton and Steel. When you sign up for the workshop, you’ll not only receive the supply list, but a coloring page so you can design what your watch will look like prior to the class. Be sure to sign up today as space is limited. Next, Susan presented more information about Chawne Kimber’s visit to the PMQG. 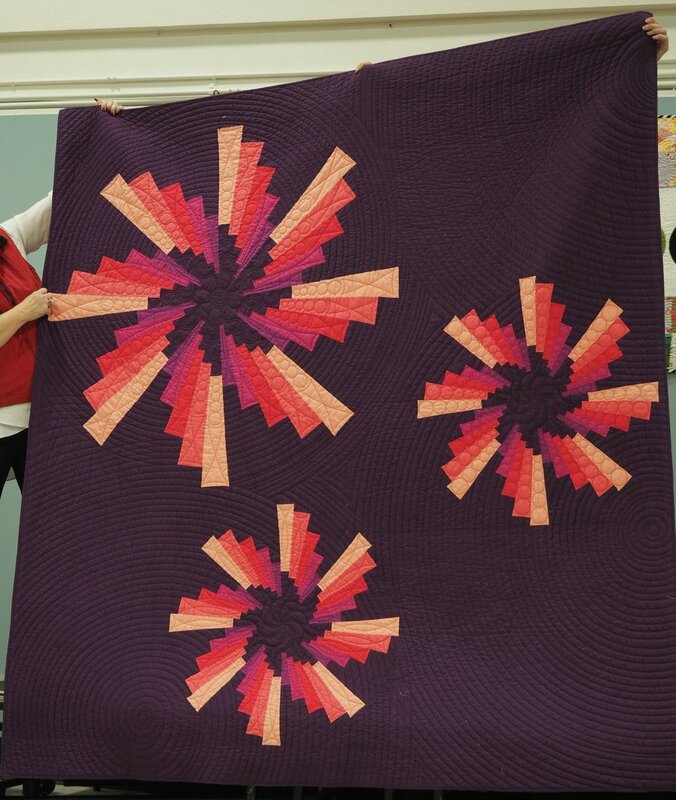 She’ll be lecturing at our June 21st meeting and then on Friday, June 22nd she’ll present the class Adventures in Small Piecing. 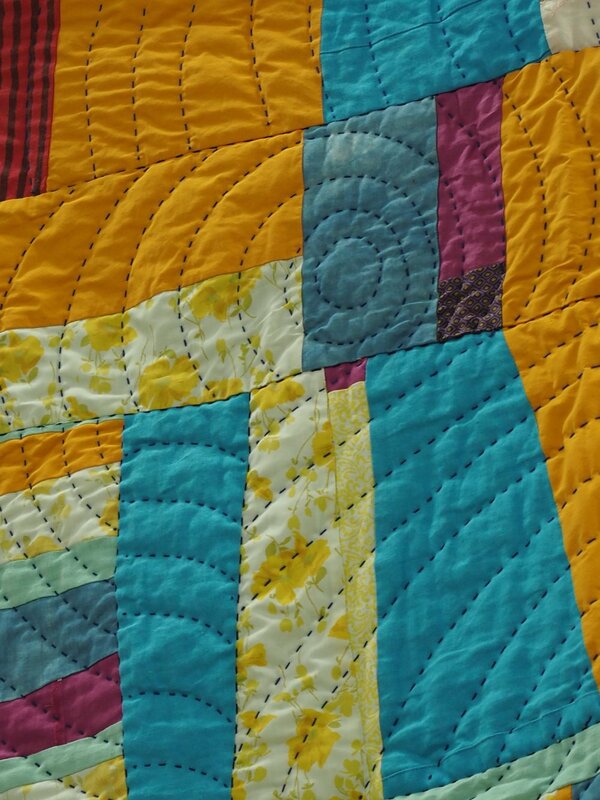 On Saturday, Chawne will be teaching Improvisational Hand Quilting. Be on the lookout for these classes to go on sale on Tuesday, May 1st. The time of the classes going on sale will be announced closer to May 1st on our Facebook and Instagram pages. Finally, Susan announced that Denyse Schmidt will be our speaker on December 6th and will be teaching full day classes on December 7th and 8th. We’re working on confirming details for her classes and will announce them as soon as they’re finalized. In May, Alison Glass will be our speaker. If you haven’t signed up for a PMQG membership, be sure to do so, as we are expecting this meeting to be popular and we will be charging a small fee for anyone who is not a member. After these announcements, we proceeded to the main programming of the night, the “Learn Something New” round tables. During this, we had four stations set up that members could go to and talk to experts in four topics. 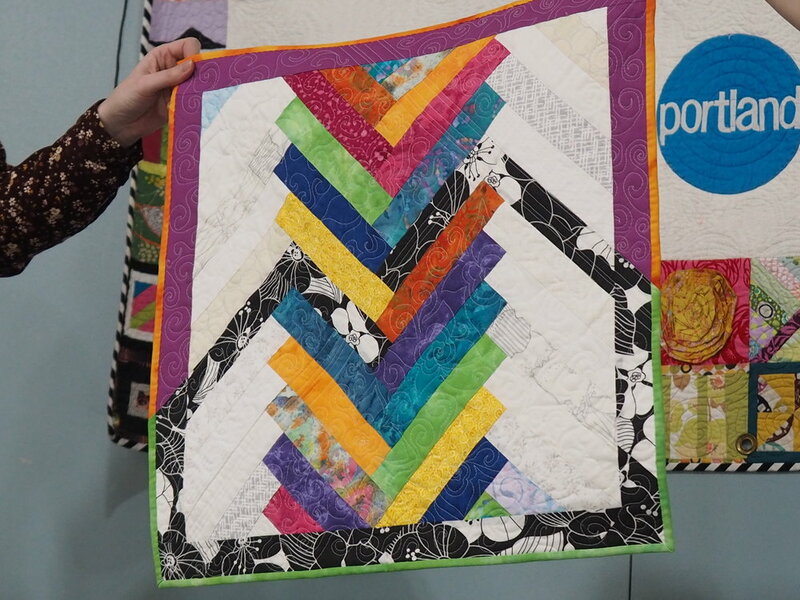 Cath Hall (@wombatquilts on Instagram) hosted the Charity Quilting table, focusing on how members could contribute to the various PMQG charity projects. The second table was with Amanda Clow (@amanda_panda_pop_6) who was talking about Quilt Canvas (@quiltcanvas), an online quilt design program. Amanda and Quilt Canvas has provided PMQG with a discount code for members to try out Quilt Canvas for quilt design for FREE for one month for all newly registered email address. The code is PMQG-4. The third table was with PMQG Photographer, Matthew Stovall (@mbstovall) who spoke about how members could take effective photos of their quilt projects. 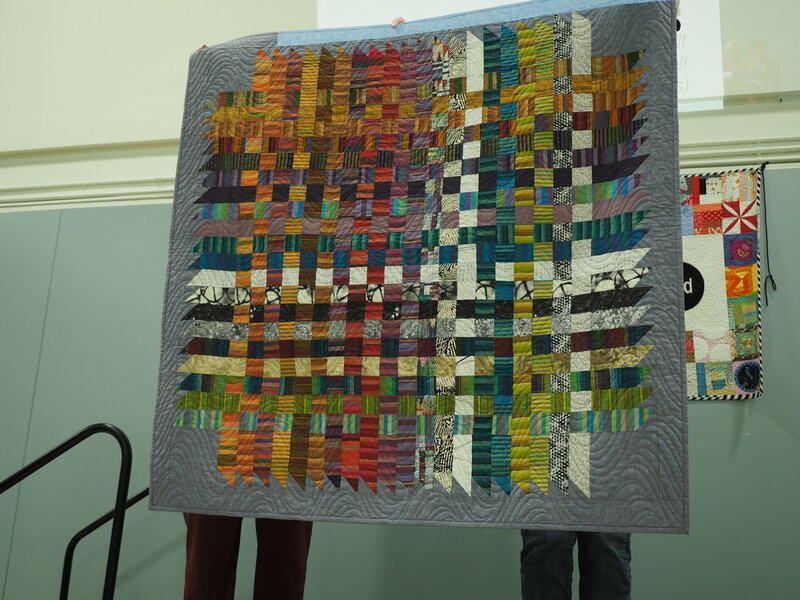 Finally, Nancy Stovall (@nstovall) and Kazumi Peterson (@kpetersonquilting) spoke to members about longarm quilting and how best to prepare their quilts for the longarm quilting process. After our break, we learned about April’s Bespoke Block of the Month from Michelle (@stitchwellandprosper), the tartan. This block focuses on nesting seams to ensure perfect points. Be sure to utilize our two new resources, the PMQG Library and PMQG Listens playlists. Both of these resources are linked on our website under the resources tab. Our guild still needs a few volunteers! We need help with closing of Sew day on September 1st and October 6th. We still need a volunteer with our New Member and Guest Welcome Program. This is a position that needs to be filled, as a good welcoming first impression will make it more likely that person joins the guild. Finally, Fabric Depot spoke about their upcoming events surrounding Spring Quilt Market. They are hosing a “Cocktails with Cotton and Steel” event, a Tula Pink event, and other various classes. Be sure to check out their website for the most up to date information about these events. Kimberly Kight @kmelkight from @cottonandsteel will be visiting us next month to teach her Memphis Time workshop May 13th, 10am-4pm at the St. John’s Community Center. Each 17”x90” watch block uses straight piecing, paper piecing, appliqué, and curved piecing, so there is never a dull moment! We hope you can make it to our April Meeting, next Thursday, April 19th! 2018 Membership Sign Ups - If you haven't done so, please renew your PMQG Membership! Save time and skip the line by renewing your membership online! You still have the option of purchasing your membership at the April meeting. Learn Something New! Have you been stumped by photographing your quilts? Have questions about what you need to do to send your quilt to a longarmer? Heard about Quilt Canvas but haven't been able to explore it yet? At our April meeting, we'll have experts for all three there for you to find out more and answer your questions. Bespoke Block of the Month - Your Secretary, Michelle has been hard at work designing this year's program. The fourth of nine blocks will be debuted at this meeting. Greetings members! On March 15th, we met for our third meeting of the year. Kimberly, our president began the meeting by welcoming all attendees. Next, she welcomed all of the new members and wished all members who have a March birthday a happy birthday. The 2018 goals for the organization were shown again, and you can find more information about them here. Next, the PMQG Charity programs were discussed. Camp Erin is the first organization that will be the recipients of the PMQG charity quilts in 2018. Camp Erin is the largest national bereavement program for youth grieving the death of a significant person in their lives. Quilts for Camp Erin should be twin sized (minimum 39” x 76” and be child appropriate in theme and fabric. Campers are aged 6-17 and the camp often has a special need for quilts that may appeal to boys, especially teen boys. 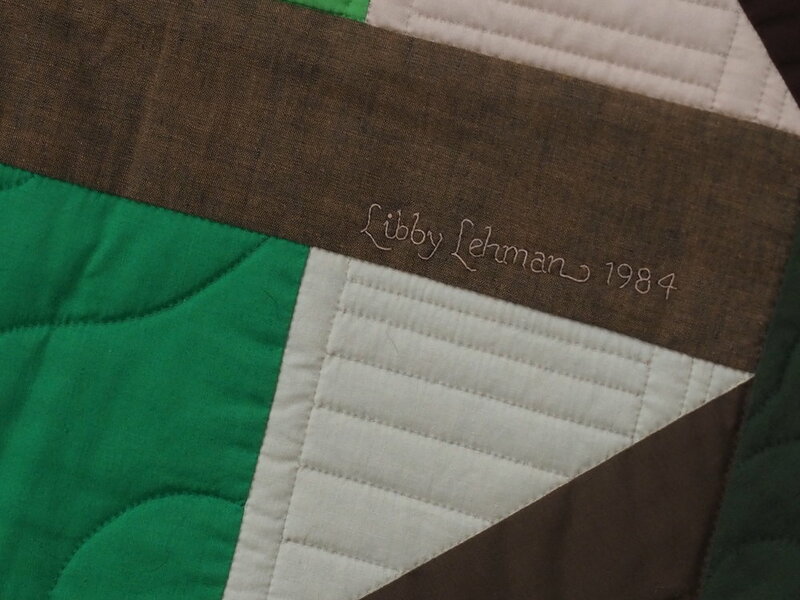 Our ongoing charity quilt recipient is the Doernbecher PICU. The PICU would like to receive quilts from 36” x 36” to twin sized. Boy-friendly quilts are always in high demand. Be sure to visit the charity quilt table at our meetings to take a quilt to work on. 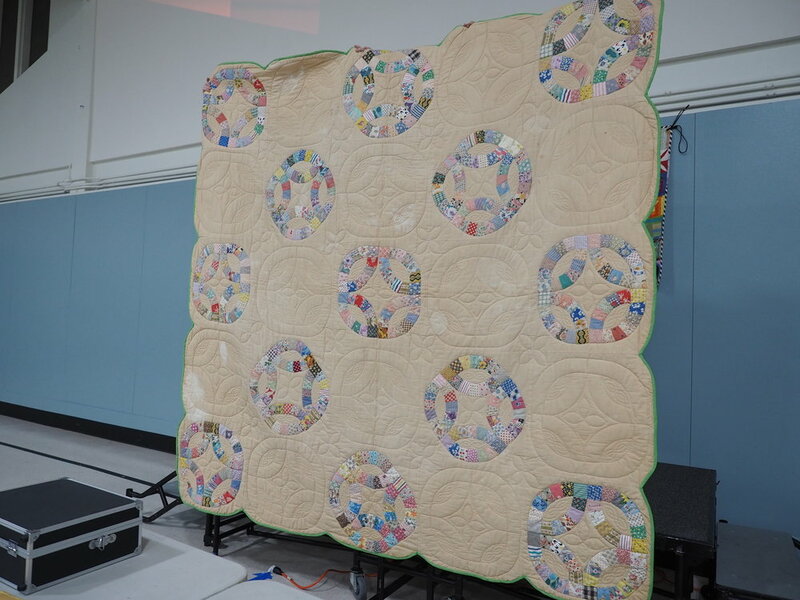 There are many quilts in various stages that need your help! Take fabric for a top, take a quilt to practice your free motion quilting or take a quilt to bind to donate your time. Be sure to visit the next charity sew day hosted by Modern Domestic on March 22. Everything is provided, just bring yourself! Find out more information here. Our first Charity Zipper Bags Project recipient is Bradley Angle. Bradley Angle helps survivors escape domestic violence and rebuild save and prosperous lives. Any sized zipper bag will do. Be sure to visit our charity webpage to see what other kind items are needed by Bradley Angle. 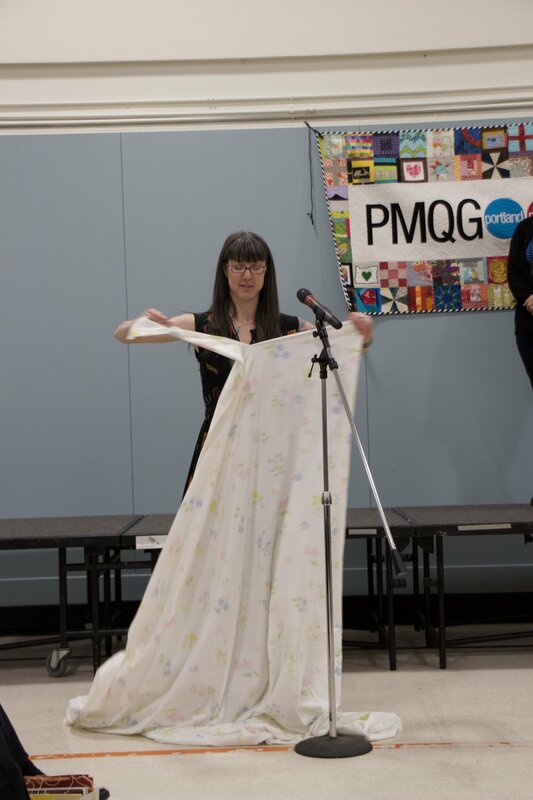 Next, Anne presented information about the PMQG Library. The library is currently open, you can find it under the resources tab on our website. Only PMQG members can check out a book for the time period of one month. You can pick it up at sew days, guild meetings or Eastside Hand Sew Happy Hours. Once your book is checked out, it will be due at the next general guild meeting. Any overdue books will incur the fine of $1.00/month. The PMQG library is able to take book donations as long as they suit the PMQG. Be sure to email the titles to portlandmodernquiltguild@gmail.com prior to bringing them in for donation. We’re also going to be debuting a classified ad section on the website, with proceeds going towards the PMQG scholarship fund. This will be a great place to list your items for sale or promote a local business or event. The ads are available for $5/month with a word limit of 100 words. Any photos provided need to be 300 x 200 pixels. All business members receive one classified ad as part of their business membership. Ads are due by the 28th of the month and will run for one calendar month. Classified ads are available for purchase through the guild shop. We’ve taken all of the information you provided through the PMQG Listens survey and have created two web pages under the resources tab. The first is a page for Spotify playlists that were created from music suggestions. The second is a podcast directory, with the podcasts being separated between clean and explicit podcasts. Be sure to click on the podcasts to find out more information about them. If you have some music or podcasts to suggest, please find a submission form at the bottom of both of those pages to send them to us. Hot Cross Buns, AnnMarie Cowley – published in Modern Patchwork! 3rd prize, Our Colorful Orchard, by AnnMarie Cowley! 2nd prize, Terrace, Violet Craft! 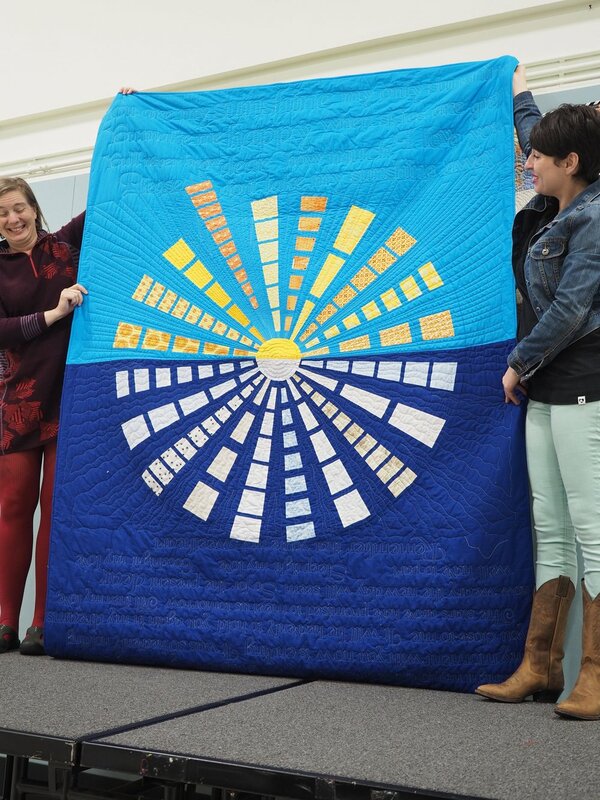 More than 40 people contributed to our beautiful charity quilt shown at QuiltCon, “Northwest Passage.” Anne Tinnesand drafted the design, Joyce Gieszler created the patterns, AnnMarie Cowley sewed it together and bound it and Kazumi Peterson quilted it. Four of our members who attended the 2018 QuiltCon presented their thoughts and impressions of the show as a panel. Violet Craft, Karen Lee, Suzanne Gray and Sam Hunter presented a slideshow of their photos from the quilt show, which you can see below. Violet Craft’s highlights of the show were curves, intricate piecing and perspective. She said there were a lot of big stitch hand quilting quilts. Next was Karen Lee. She made a point to focus on quilts that surprised her. She suggested that members check out the work of Christine Perrigot (@ccpquilt on Instagram) and Diana Vandeyar (@dianavandeyar on Instagram). 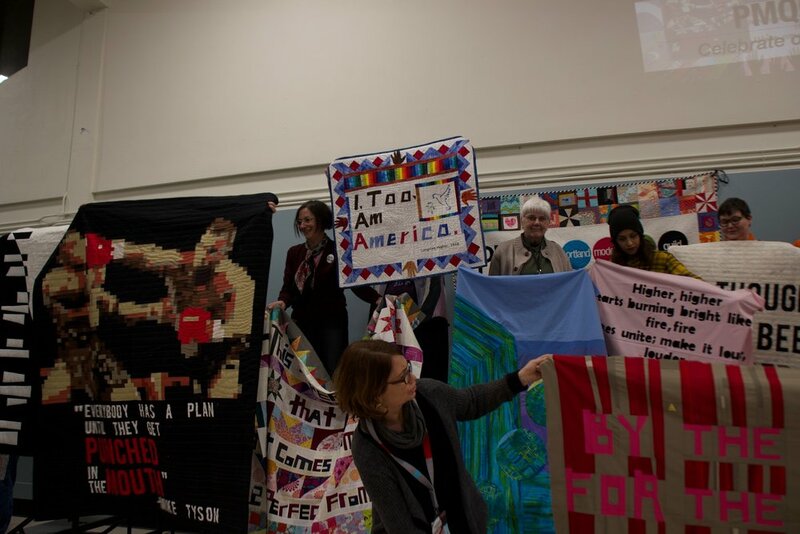 Suzanne Gray presented a lot of the quilts focusing on activism and social justice. She was extremely impressed with the work in the Youth category. 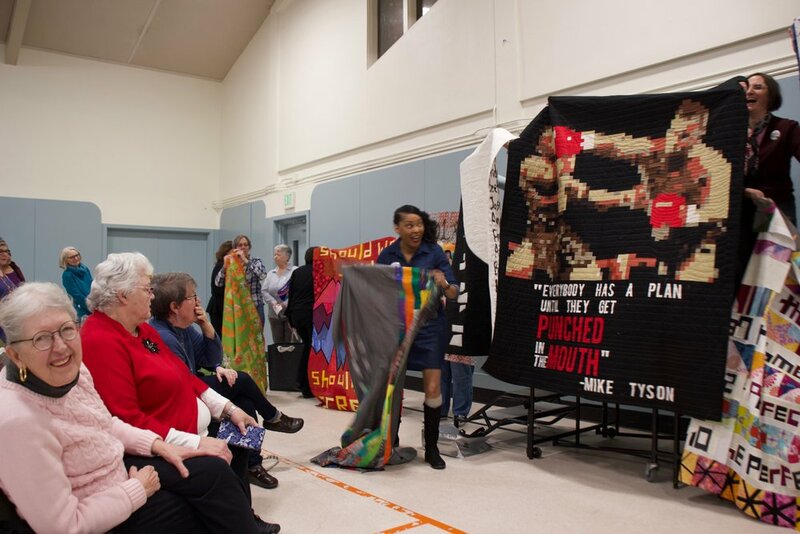 There were quite a few quilts from members of the Social Justice Sewing Academy (@sjsacademy on Instagram). Sam Hunter was most affected by the NAMES Project AIDS Memorial Quilt Gallery. This special exhibit was curated by Mary Fons, from the AIDS Memorial Quilt. 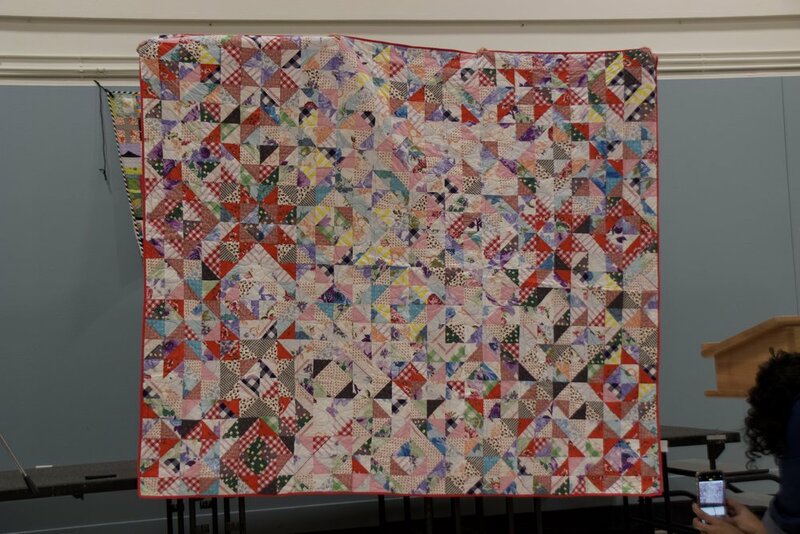 Please be sure to look at the slide show presentation below to check out all of the quilt photographs presented by the panel. Special thanks to Suzanne for leading the panel! Luxe Fabric donated by Michael Miller Fabrics and the Noodlehead Super Tote pattern: Laurie F.
Indah Pop Jelly Roll donated by Hoffman Fabrics and the Noodlehead Caravan Tote and Pouch pattern: Ellen C.
QuiltCon Goodie Bag: Alice S.
Thank you to all of our door prize sponsors! Next, Susan presented the Block of the Month in place for Michelle. The block is the Pendleton 49er-inspired Western plaid. Visit the Block of the Month page to download the instructions for all of the blocks including this month’s. Be sure to take the Small Quilt Groups survey if you haven’t had a chance to and are interested in being in a Small Quilt Group. The survey will be available for one more week. Interested members will be hearing from the Small Groups Coordinator by April 1st. We will be looking to assign volunteer group leaders for each small group. Our goal is to have new groups up and running in the month of April. 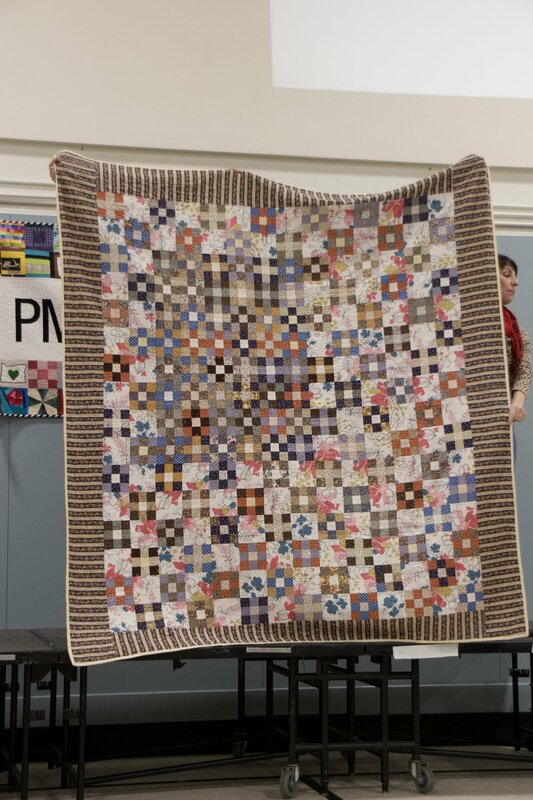 The Clark County Quilters have invited the PMQG to show 10 quilts in a special exhibit during their quilt show, April 5-7. 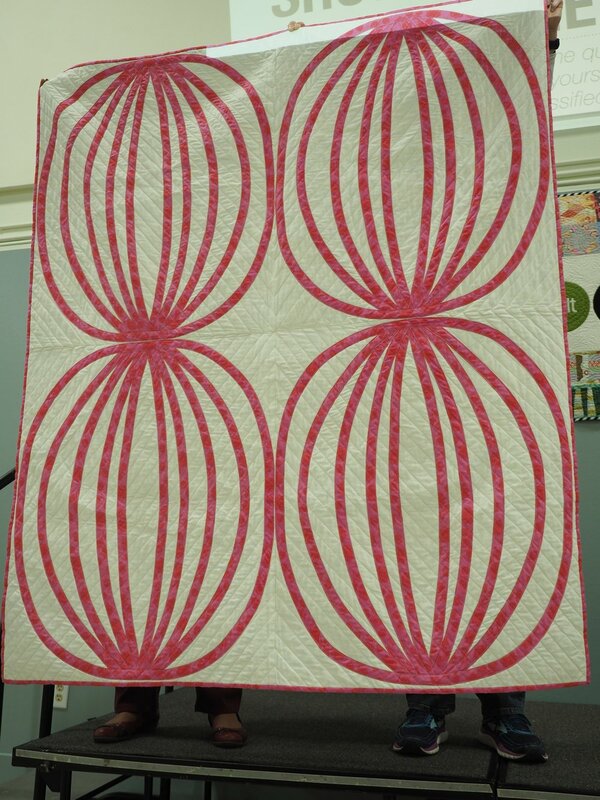 If you’re interested in showing, please email the guild at portlandmodernquiltguild@gmail.com as soon as possible. The PMQG UFO club is currently running. Visit the UFO Club table to participate. You’ll submit a list of 10 UFO’s that you commit to finishing in 2018. Bring the finished UFO to the next monthly meeting. Be sure to email Jennie at jennie.mckee22@gmail.com so she can enter your finished UFOs in the drawing spreadsheet. You’ll receive one entry for each UFO finished. In December, the winner will be drawn and will win ½ of the UFO club fees. The other half goes to the PMQG Charity program. The guild still has some volunteer opportunities! We need someone to volunteer for the New Member and Guests Welcome Program and also to volunteer for the Open Sew Day Closing on April 7, September 1 and October 6th. We will also need a new leader for the West side Hand Sew Happy Hour in July. We hope to see you at our next guild meeting on April 19th! We hope you can make it to our March meeting, next Thursday, March 15th! Don't forget! Survey responses needed for PMQG Listens and Small Groups! Both take about 5 minutes or less. 2018 Membership Sign Ups - It's that time of year again to renew your PMQG Membership! Save time and skip the line by renewing your membership online! You can sign up either at the beginning of the March meeting or during the break. QuiltCon 2018 Recap - We're planning on having a panel of members who attended QuiltCon 2018 in Pasadena, CA. We'll be celebrating guild members achievements and find out about all the amazing classes, lectures and events attended. Be sure to put in your planner next year's dates--February 21-24, 2019 in Nashville, TN. Bespoke Block of the Month - Your Secretary, Michelle has been hard at work designing this year's program. The third of nine blocks will be debuted at this meeting. Show and Tell - After hearing feedback from guild members, we need to institue a no solicitations policy during show and tell. We're developing a page on the website for members to advertise. You'll find out more information at the March meeting. To begin, we’d like to thank our members for cooperating with our later start time for meetings due to the basketball practice that happens in the gym before our meeting. We will send updates to start times in the meeting reminder emails so please keep an eye out for these. Thank you for understanding! On February 15th, we met for the second meeting of the year. Kimberly began the meeting by recapping the goals for the year, which can be seen here. We also welcomed our nine new members since our January meeting! Don’t forget to renew your 2018 PMQG Membership. You can renew online by visiting our website. We’re also starting a new page on our website, PMQG Listens. We’re asking all of our members to fill out a short survey (less than 5 minute time commitment!) to let us know what you listen to while you sew. Using that information, we’ll create a playlist of music and podcasts and put them up on the website. You can find the survey here. Any members who signed up for the MQG 2018 Spring Riley Blake Fabric Challenge, your bundles are in! Collect them at our next meeting. Don’t forget that the deadline for submission is April 22, 2018. Next, we had Kelly Cole from Vintage Fabric Studio speak about using Vintage fabrics for sewing. Vintage fabric means that the fabric is at least 20 years old. The Vintage Era is from 1920-1980, while antique is at least 100 years old. Look for these selvedge names: Joan Kessler, Concord Fabrics, Bookhaven, and Marcus Brothers Textiles. If your fabric is really thin, try adding some woven fusible interfacing to stabilize it. When quilting, more basting is better, use a sharp thin needle and if you’re using a vintage sheet for the backing, make sure it’s in good condition. Kelly has offered a coupon code for her website! Use PMQG10 to receive 10% off your order until March 14th. You can also receive free shipping if you use the coupon code PICKUP to pick up at a PMQG sew day or meeting! You can use both coupons at once! Kelly demonstrates how to get a vintage sheet on grain. After Kelly’s talk, we continued with announcements. The first is that Bradley Angle will be the first quarter recipient of our zippered bags program. Find out more information about what is needed on our updated Charity Zipper Bags page. Thanks to Patty for working on this important project! Next, Linda has been working on organizing the PMQG Small Groups. We’d like to find out more about what the group’s needs are. We have another short survey for you to fill out here, so we can best organize. Our February Bespoke Block of the Month was debuted. Michelle has designed a Herringbone Twill block for our February block, and the instructions can be found here. This block is made using strip piecing. 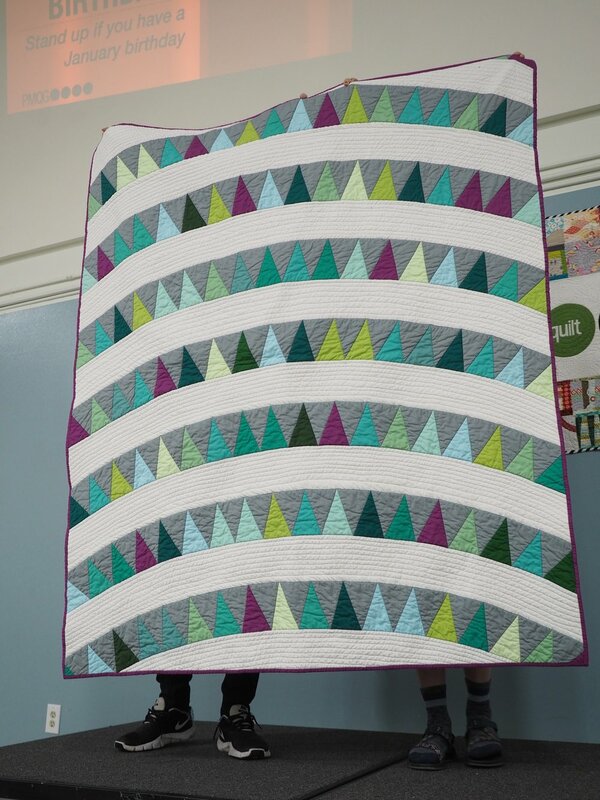 The Bespoke Block of the Month has been designed by our secretary, Michelle (@stitchwellandprosper). The finished quilt will be made of nine blocks, each inspired by a plaid or check. The blocks are designed to work in a 24” finished block size, made up of smaller 12” blocks. Be sure to tag your social media with #pmqg2018bom. After the Block of the Month, we had a brief showing of the Word Quilts that members have been working on for the past year. Members who have submitted to be considered to the 2018 Sisters Quilt exhibit, “Words, Unbound” should have heard who has been accepted into the exhibit. Congratulations to everyone accepted! Thank you to everyone who submitted a quilt. Speaking of the Sisters Quilt Show, we’ll be needing some volunteers to work as show hostesses for 2 hour shifts. Volunteers will be working in pairs for a 2 hour shift. You’ll be patrolling a small section of town and you'll also need to keep an eye on the quilts and hand out show information and answer any visitor questions. Be prepared to walk or stand for the better part of a two hour shift. Find out more information here. Please email the guild at portlandmodernquiltguild@gmail.com to volunteer. Next, we gave out our raffle prizes. 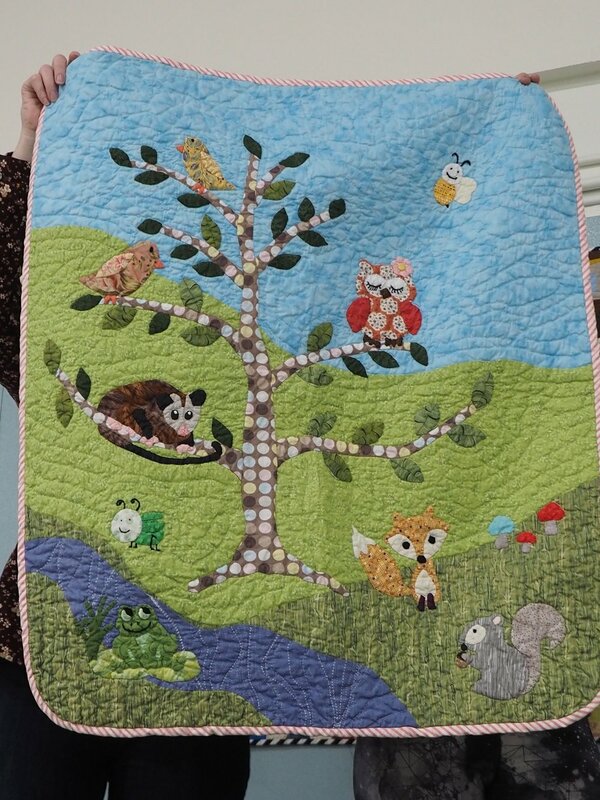 The book Wise Craft Quilts (donated by a PMQG member was won by Laura Broughan. The book Modern Roots (written and donated by PMQG member Bill Volckening) was won by MaryAnn Todd-Thompson. The Super Tote pattern and fabric (donated by Noodlehead) was won by Christine Yi. The Fat Quarter Bundle, and Charm Squares donated by Kelly Cole at Vintage Fabric Studio was won by Sharon Bishop. We still have some volunteer opportunities! PMQG still needs a member to step up and help out with the New Members and Guests Welcome Program. This person recruits and manages Meeting Hostesses and is responsible for the New Members and Guests Table at the monthly meetings. If you’re going to QuiltCon, please let us know by filling in the form here! In March, we’re looking to have a panel to give a recap to the membership about their experience in Pasadena. Please share photos on Instagram, especially of PMQG Member quilts. We’re looking to set up an email group of members to make it easier for you all to plan any group activities while in Pasadena. 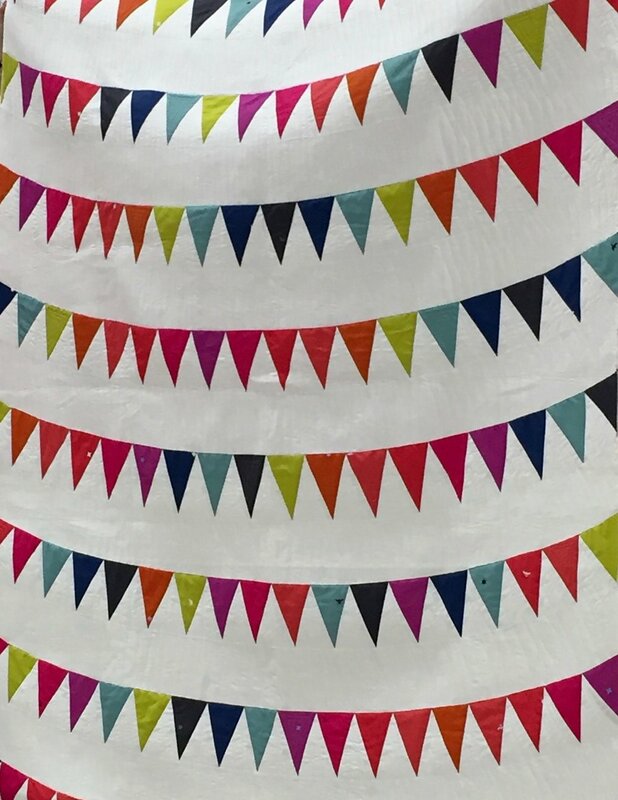 Please share your Quiltcon photos on Instagram, especially of PMQG members' quilts or classes, and use the tag #pmqgquiltcon so our guild members can follow along with you! Please feel free to email any photos you'd like to share at portlandmodernquiltguild@gmail.com. The Spring Retreat is full, but a waitlist is available. Please email portlandmodernquiltguild@gmail.com if you would like to be added to the list. For those of you who have signed up and have not yet paid we will need that within TWO WEEKS of signing up to complete your reservation or your spot will be released. Details about the swap will be sent out soon. One last announcement, there’s been a change to our Open Sew Day Discounts. PMQG Members will receive a 30% discount off their purchases during Open Sew Days at Fabric Depot. Go to the Special Orders counter to ring up your purchase and receive your discount (must show membership card!). Be sure to mention the discount for PMQG Sew day when getting fabric cut. Reverse of Pink by Barbara C.
See you all on March 15th! We hope you can make it to our February meeting, on Thursday, February 15th! Don't forget! Sign ups for the 2018 Spring Retreat Go LIVE February 10 at 10:00 am! More Information about the retreat can be found here. Please bring them to the meeting! We'd love to see everyone's tops or completed quilts during a special Word Quilt group showing! You'll receive an extra raffle ticket for bringing in your top to share. 2018 Membership Sign Ups - It's that time of year again to renew your PMQG Membership! Save time and skip the line by renewing your membership online! You can sign up either at the beginning of the February meeting or during the break. Kelly Cole from Vintage Fabric Studio will be our speaker. She'll be speaking about how to use vintage fabrics in modern quilts. She'll also have a trunk show of vintage quilts as well as quilts made using vintage fabrics! Time permitting, we'll have a Q&A as well. Bespoke Block of the Month - Your Secretary, Michelle has been hard at work designing this year's program. The second of nine blocks will be debuted at this meeting. Be on the lookout for a Fabric Depot VIP Pass for their Warehouse sale on February 17th! Passes will be sent to 2018 PMQG members on February 15th! February 10th - Spring Retreat Sign Ups go live at 10:00. On January 18th, we met for our first meeting of 2018. The new board would like to thank everyone for their patience, due to the wait for membership sign ups and picking up membership cards. It was the first meeting for the new board and a final good-bye and thank you to our 2017 board. Growing our Guild - goal of 400 active members. Next, we had a lecture and trunk show with Christina Cameli. 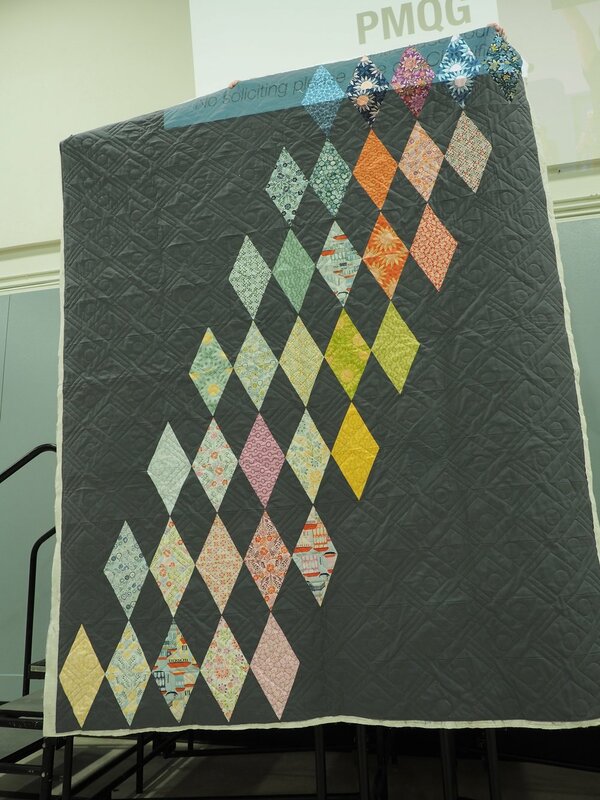 She featured the quilts from her new book Wedge Quilt Workshop. During the lecture, Christina gave tips for using both the 9 degree and 10 degree wedge rulers. We thoroughly enjoyed Christina’s talk and walked away with a ton of inspiration! 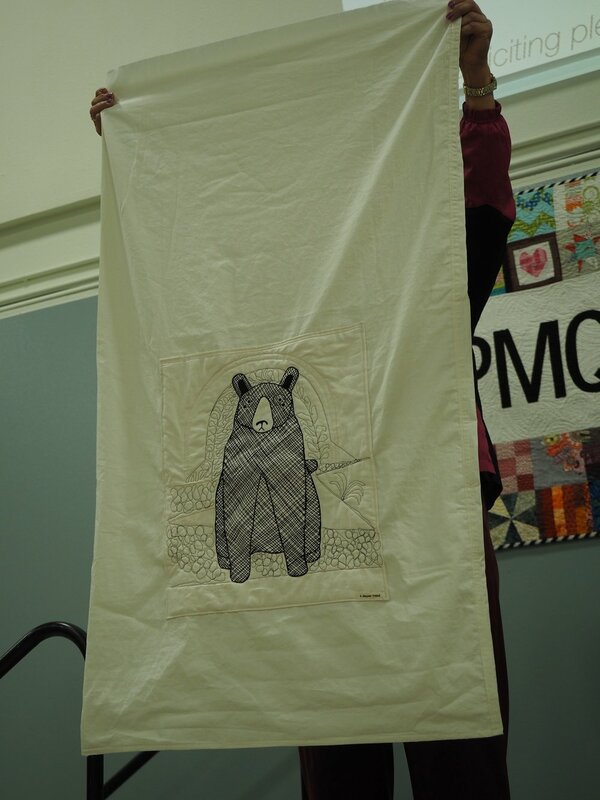 Just check out this gallery of the quilts she presented! Christina Cameli is teaching two classes at Modern Domestic and there is a 10% discount for 2018 PMQG members! Join her for Free Motion Weekend, January 27 and 28 and Grid-based Free-Motion Quilting, February 16. If you’re interested in taking these classes you can find more information on their website. PMQG is looking to host some workshops with Christina in April. Stay tuned for more information! Thank you to all of our generous sponsors of door prizes! The first quarter quilt charity is Camp Erin. Camp Erin is the largest national bereavement program for youth grieving the death of a significant person in their lives. Minimum size is 50 x 60 inches. Delivery will be in June. Charity Sew Dates are listed on the PMQG website under Events. The theme is “Words, Unbound” minimum size is 40 inches across, 80 inches max. 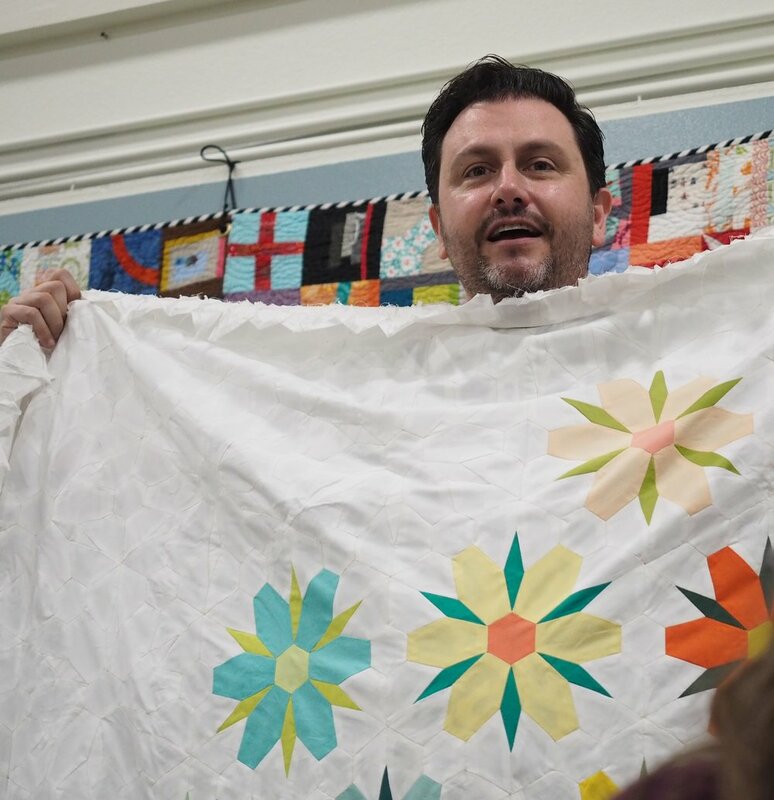 No profanity as the quilt show is family friendly. 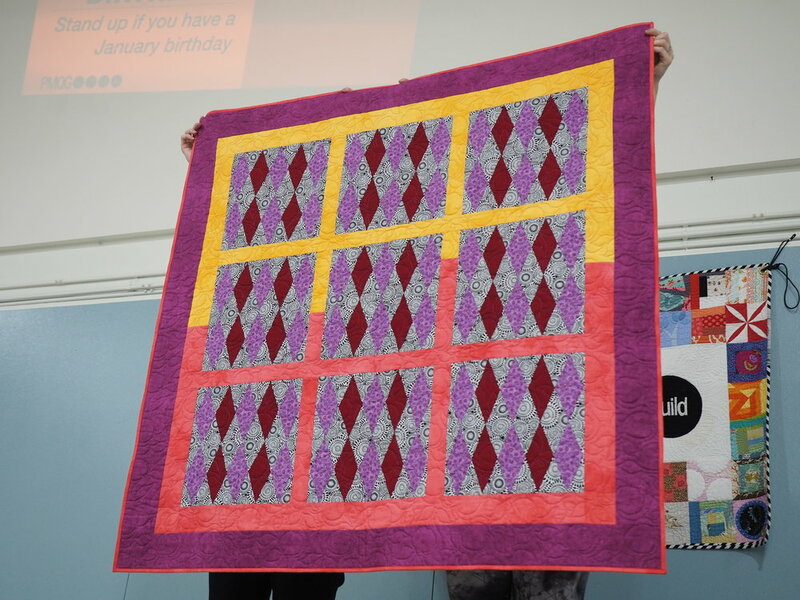 The photos of your quilt are due to the PMQG by February 6th. See the website for more information. 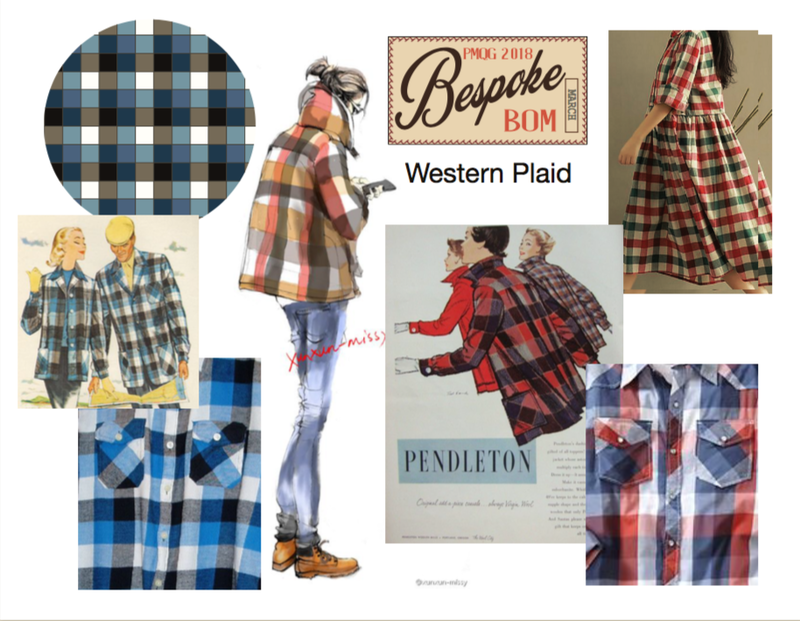 We introduced the Bespoke BOM, a year of piecing plaids and checks! The first block was debuted, the Buffalo Plaid. Share your makes, tips, tricks, and variations on IG and tag #PMQG2018BOM Instructions have been posted to the website. Will continue on the 4th Sunday of each month, with the next meeting on January 28th. Westside location has changed to Jim & Patty’s Coffee People at 4130 SW 117th in Beaverton. Happening April 12-15th at Camp Tilikum in Newberg Oregon. Registration Opens February 10th, 2018 at 10 am. There will be a waitlist if the retreat fills up. Watch the website and social media for more information about the retreat. 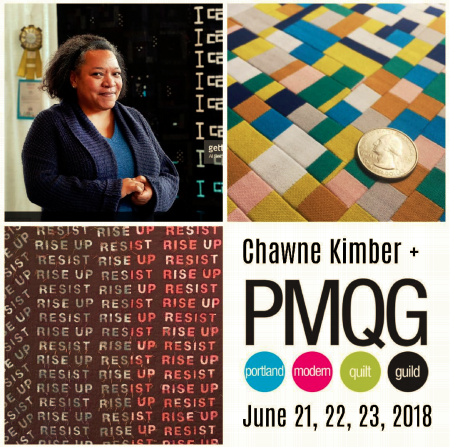 The PMQG is looking for a member who is going to QuiltCon who would be willing to serve as a roving reporter and post images to the guild Instagram account. 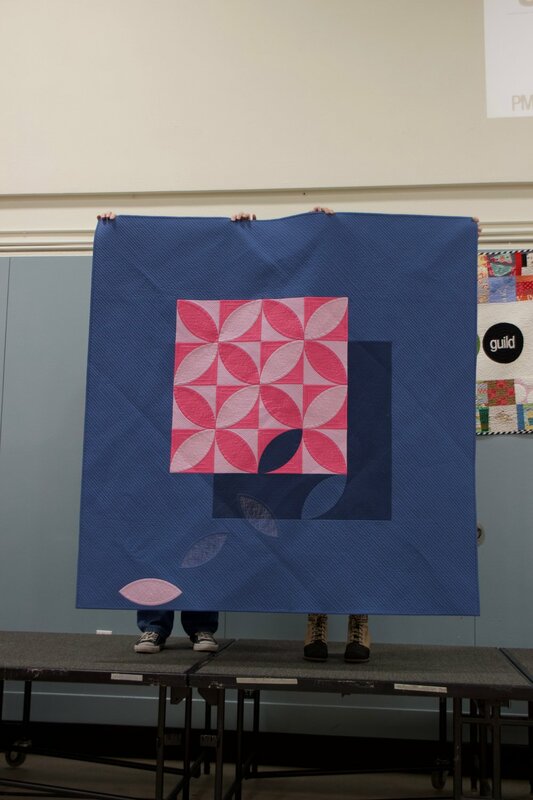 If you’re interested in helping the guild out, please email portlandmodernquiltguild@gmail.com. 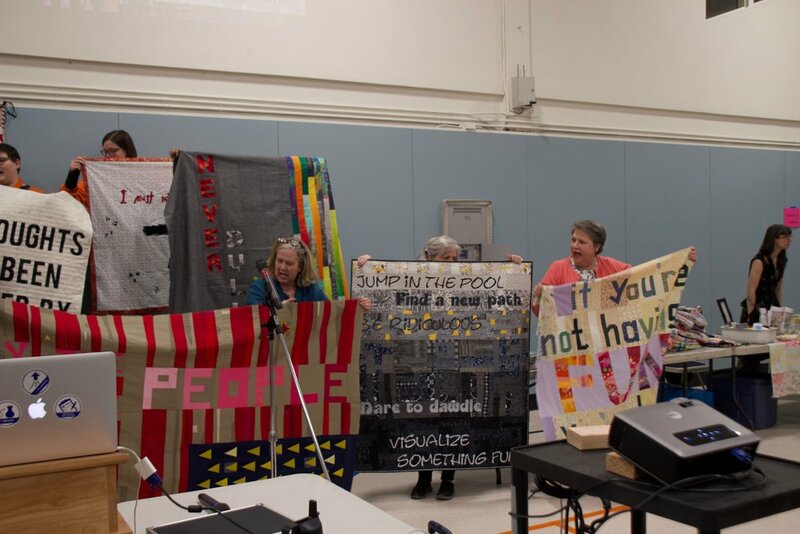 As always, we had a beautiful and inspiring group of Show and Tell Quilts. They can also be seen here or on Flickr. No login or password is needed. February 10th - Spring Retreat signups open. We hope you can make it to our January Meeting, next Thursday, January 18th. February 6th is the final day for submittal of a photo and dimension information of your Word Quilts for the PMQG Exhibit at Sisters Outdoor Quilt Show. Find out more information about this at the January meeting. If you are unable to attend the meeting, submittal requirements will be posted on the website. 2018 Membership Sign Ups - It's that time of year again to renew your PMQG Membership! Save time and skip the line by renewing your membership online! You can sign up either at the beginning of the January meeting or during the break. Christina Cameli lecture and Trunk Show - On January 2nd, Christina's brand new book Wedge Quilt Workshop was released. Christina will be bringing a selection of the quilts from the book to the meeting as well as providing a talk to members. If time permits, we'll even have a Q&A. For more information about Christina Cameli, check out her blog. Bespoke Block of the Month Debut - Your Secretary, Michelle has been hard at work designing this year's program. The first of nine blocks will be debuted at this meeting! Our December meeting / Holiday Party had something for everyone: Guild members selling handcrafted items and destashing fabric, a Wheel of Fortune with prizes for all, a tasty dessert potluck, a container swap featuring Santa himself, so many raffles, and the last Show and Tell of 2017. The first part of the meeting was dedicated to shopping, spinning, eating, and grabbing 2018 memberships in time to be entered into the special 2018 member raffle. And Sally brought 50% off coupons for all! Thank you, Fabric Depot, for being one of our business sponsors and for all of the collaboration this year! If you would like to volunteer for any of these positions, please email the Guild. Avoid the lines in January and purchase your 2018 membership on our website now! Our 2017 president, Tamara King, thanked the 2017 Board for all their hard work and great ideas this year, and then, on behalf of the Board, she thanked all of our Volunteer Coordinators, everyone who volunteered this year and everyone who participated in our Charity Quilts and Charity Zipper Bags programs. It was a fun and action-packed year for the PMQG, and it took a lot of people to make that possible. Thank you to all of you, and thank you to the 2018 Board, who will be leading the Guild to a fun and exciting 2018. 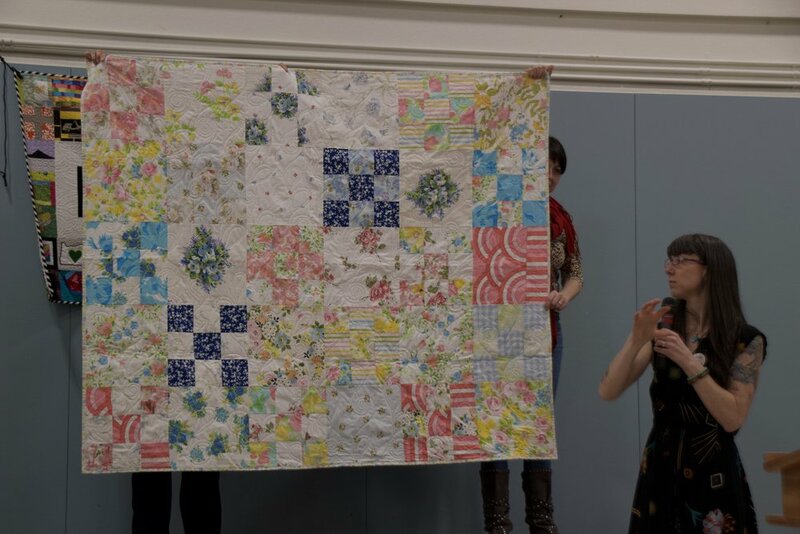 Our Vice-President, Tania Johnston, then presented a very surprised Tamara with a beautiful quilt planned by Tania and our Secretary, Anne Matlak, with blocks made and inscribed with messages by the members. 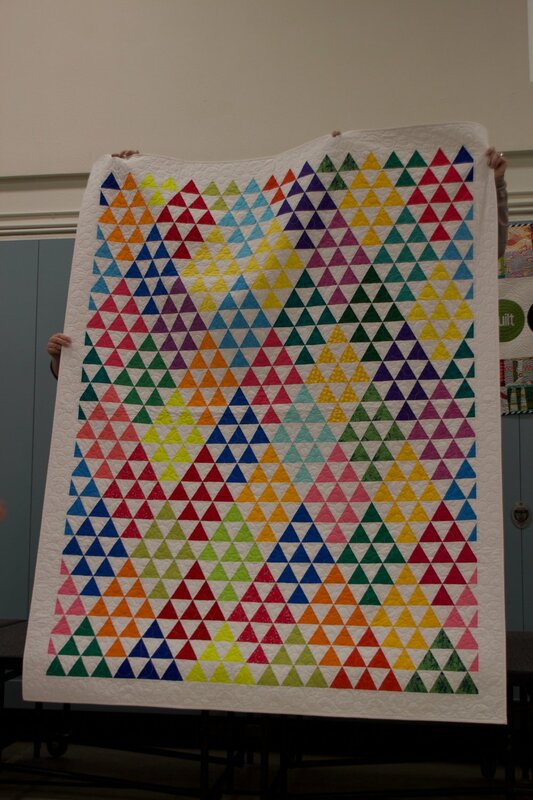 It was a complete success -- a total surprise and an absolutely wonderful quilt that will be treasured. The theme of this year's holiday swap was Containers, and the rules were simple: using their own fabric, members made a thing that can hold other things (a bag, box, wallet, journal cover, etc.). Sign up wasn't required; anyone who wanted to participate brought a container and was given a number. Fifty-four cool containers were made by our members, and Santa even dropped by to hand them out at the break. The 2017 Queen of the UFOs was crowned by our UFO Club Coordinator, Marcia Mersky. For each project completed, club members got one entry. A name was chosen from the UFO jar, and the winner was Karen Bailey, who won half of the UFO Club entry fees of $125. The other half of the fees goes to the PMQG Scholarship Fund. Congratulations, Karen! 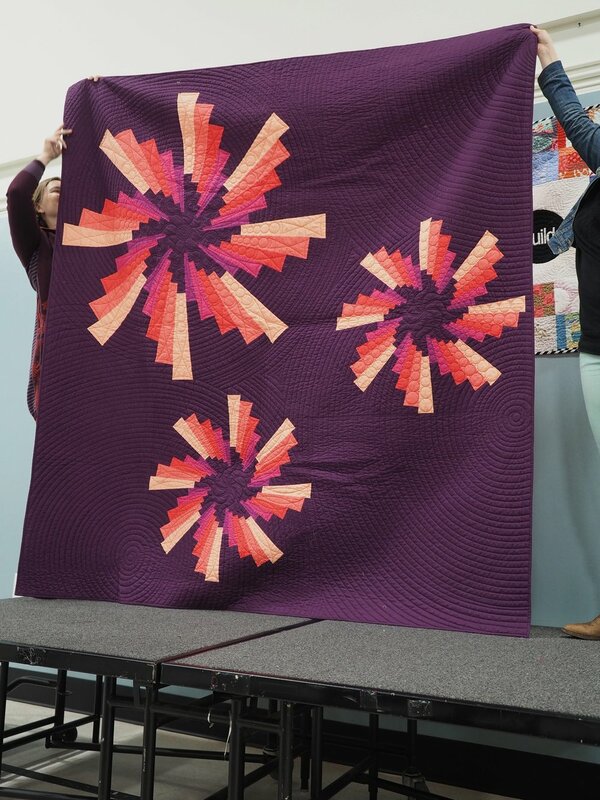 The winner of the 2017 Block of the Month Quilt, Stars Galore, designed and made by Anne Matlak, was our 2017 Membership Coordinator, Karen Lee! The Guild raised nearly $1,000 for our charity programs from the sale of raffle tickets! Congratulations, Karen! The winner of the 2018 Membership raffle (you just had to renew your membership before or at the meeting to be entered) was Cindy Smith. Cindy won a fabulous prize with items donated by PMQG member Bill Volckening, Hoffman Fabrics, MonaLuna Organic Fabrics, Noodlehead, and June Tailor. Congratulations, Cindy! 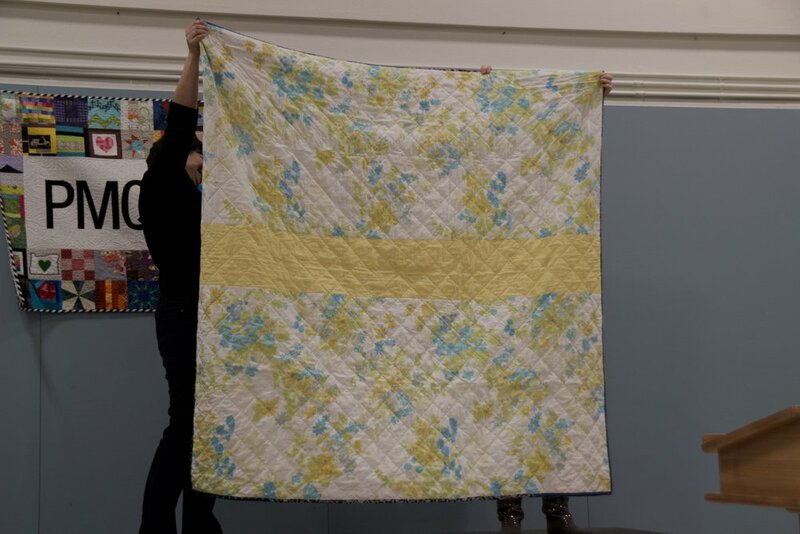 Anne Matlak made a special raffle prize for those who brought a BOM quilt or a top to show at the meeting (so many of you did, and they were so beautiful! ), and the lucky winner of that handmade gift was Alice Ringquist. Congratulations, Alice! 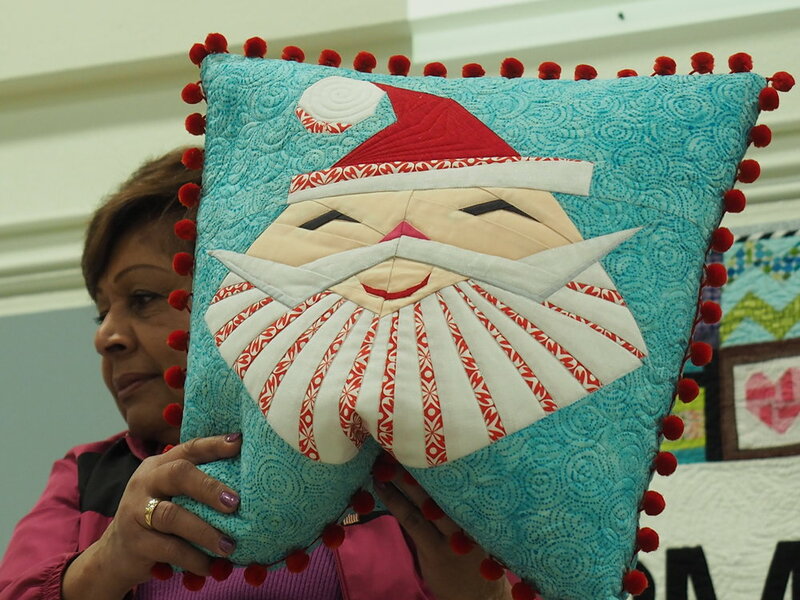 Everyone who had finished a Block of the Month quilt or top brought them to show at our December meeting. There was an impressive number of quilts, and they were all fantastic. Thank you for such enthusiastic participation and, as usual, you blew us away with your creativity. We had a really spectacular Show and Tell to finish off 2017. 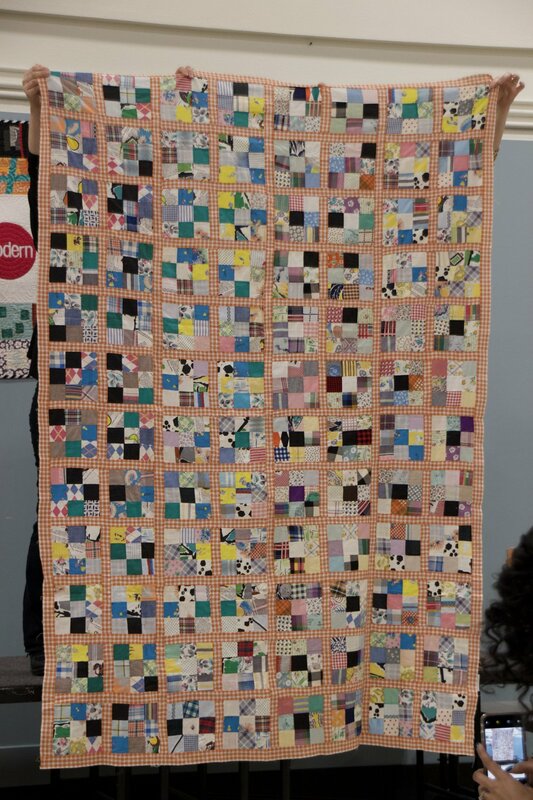 You can see all of the BOM quilts, all of the Show and Tell quilts and some photos from the party on Flickr. Every PMQG President ever, from 2010 to 2018, was at the party. Three left before we could get a photo, but we got a photo of six former and current presidents! We had a great 2017 and we're looking forward to a fantastic 2018! See you next year! We hope you can make it to our November meeting this Thursday, November 16th. Lecture by Mathew Boudreaux of Mister Domestic - "Lose Control to Find Your Voice"
As part of the December Guild Meeting, we’ll have a small holiday bazaar for PMQG members to sell any handmade items or fabric (precuts, fat quarters, and larger pieces). Any items you’re planning to sell (other than fabric) must be hand-made by you. In order to plan for the event, all vendors need to sign up ahead of time for space at the bazaar. (Note: there is no charge for a table.) Please complete the Sign-Up Form by Sunday, November 26th. Also at the December meeting, there will be a handmade gift swap for PMQG members. The theme of the swap is “Containers.” This could be a bag, box, wallet, journal cover, etc - anything that can hold something. Sign up isn’t required for the swap. If you want to participate, just make a container (please don't fill your container with any extras) and bring it to the December meeting. You will then go home with a container made by a fellow guild member. Make one, take one! Any PMQG member who brings a finished BOM quilt or quilt top to show at the December meeting will be entered into a special drawing. Remember: you don’t have to make a quilt using all nine blocks – it could also be a baby quilt, table runner, etc. We can’t wait to see everyone’s version of the BOM! 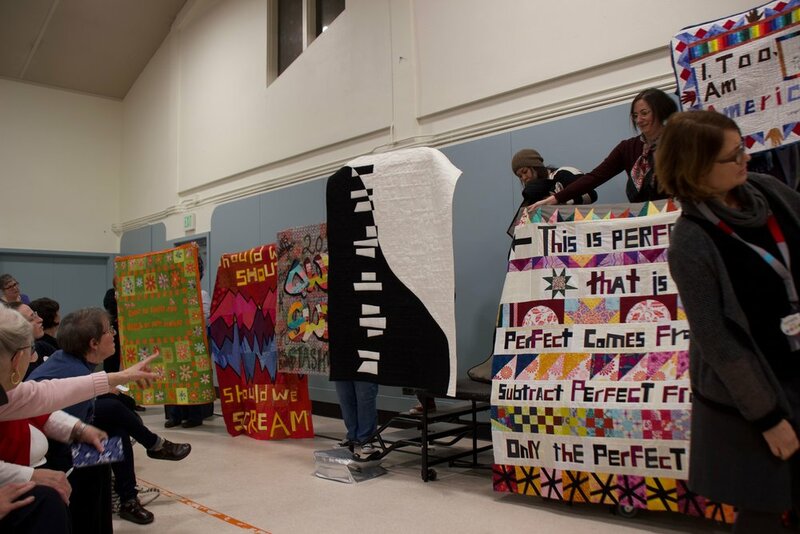 In place of our monthly meeting, we got together to celebrate our work at the First Annual PMQG Member Quilt Showcase, held at the Lagunitas Community Room on October 19th. We were fortunate to have had many submissions by our talented members, and our jury, Marilyn Joyce and Arthur De Bow (you can read about them on the Showcase page of our website), had the difficult task of choosing just twenty quilts for the show. Photos of the Showcase are on our website and on Flickr. 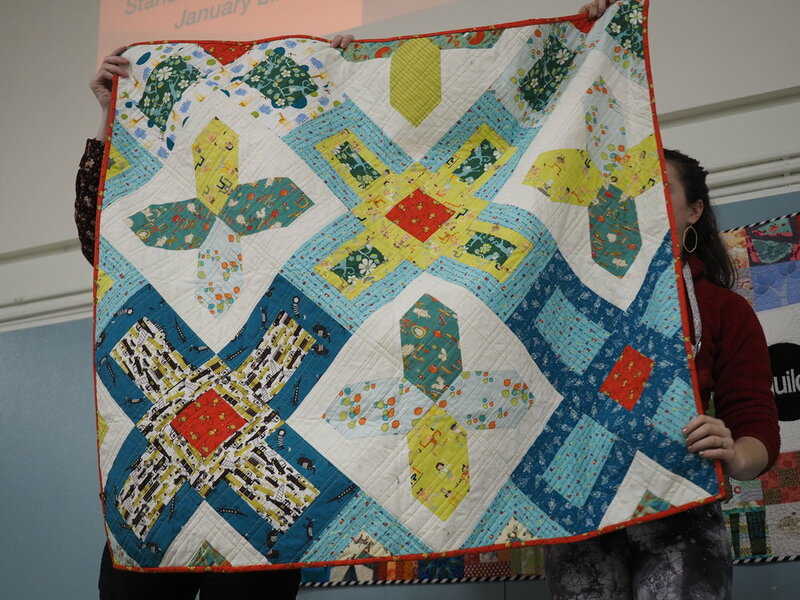 The Bountiful Challenge Mini Quilts made their debut at the Showcase, and the challenge winners (chosen by Art Gallery Fabrics and Bountiful designer Sharon Holland) were announced. Maddison Stapleton won first place for her mini, Alis Volat Propriis; Kimberly Lumapas's mini, Overflow, won second place; and Windsong by Ruthie Windsong was third. Congratulations to the winners, who will each receive a passel of prizes from Art Gallery Fabrics. You can see all of the mini quilts on the Challenge page of our website. Also check out Sharon Holland's blog post about the challenge. We did take a few minutes from admiring the quilts to announce the results of the recent Guild elections. The Amended Bylaws were ratified. 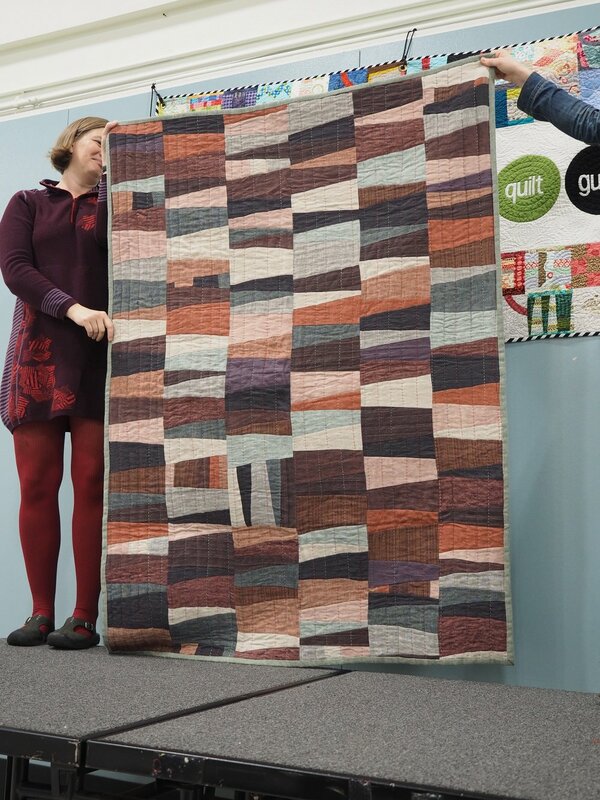 PMQG voted overwhelmingly to remain part of The Modern Quilt Guild. Thank you so much for volunteering to serve on the 2018 Board! We're looking forward to a great year. Thank you also to PMQG members Chelsea Clarke-Pitt and Jenny Rodriguez for their invaluable contributions to our refreshments and to the many Guild members who helped with set up, take down, and all the tasks necessary to put on an event like this. We couldn’t have done it without you all -- you're the best! 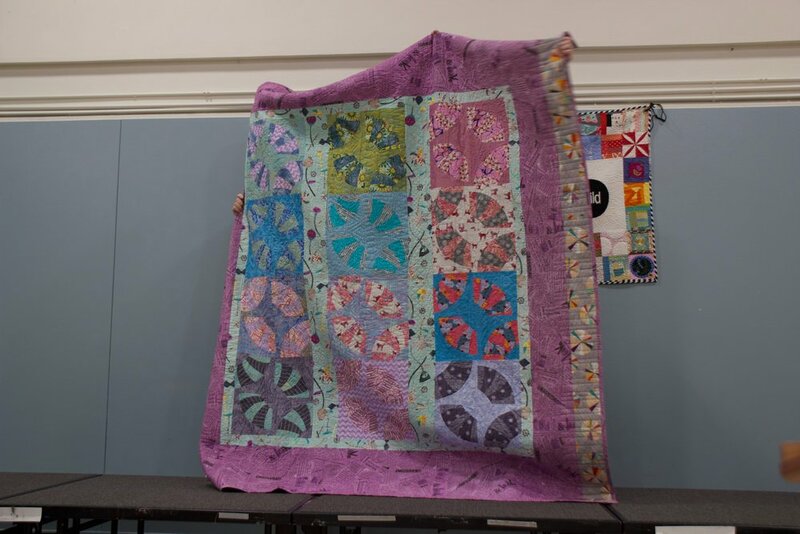 It truly was a special night -- thank you to all of our members who contributed their beautiful work and to all of you who came out in the rain to spend some quality quilty time together!